Spring is a beautiful time of year in Austin. The wildflowers are blooming in the hill country. The days are long and sunny. And in May, Austin receives a generous amount of rainfall. While spring is certainly enjoyable in Austin, it also marks a sure sign of one thing: summer is just around the corner. Even in spring, it’s not unusual for temperatures in Austin to reach into the 90’s. And once summer arrives, the Texas sun is at its most powerful. With all the sunlight and heat, you might find that your home isn’t quite as comfortable as you want it to be during the spring. Fortunately, there’s an easy solution for this. By installing residential window film for your Austin home, you can make your living space more comfortable for your family and stay contented all throughout spring and well into summer. Love the spring sun but not a fan of the heat? Stay comfortable this year with residential window film for your Austin home. 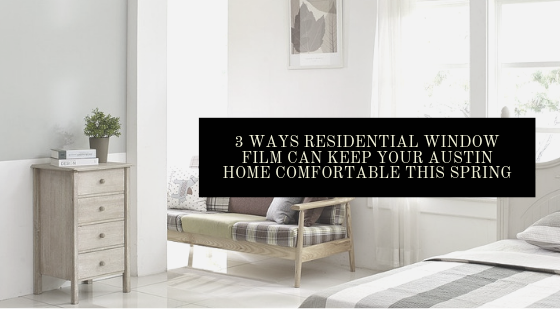 Here are three different ways window tint can make your home more comfortable and enjoyable this spring. Whether you work from home, enjoy watching sports on the weekend, or are an avid movie lover, you probably don’t appreciate glare on your tv or computer. It’s annoying and it makes it impossible to enjoy the activities you love. Get rid of glare quickly by installing residential window film for your Austin home. Everyone loves a warm, sunny day. But there becomes a point when the sun is too warm for comfort. Keep the heat out of your home with residential window film installation and experience the benefits of energy savings. With residential window film, you can easily obtain the privacy you need without having to block out light. Embrace the sun without fear of being caught in your lounge wear, draw back the shades, and let the light flood into your home! Stay comfortable this spring and get your home ready for summer with residential window film in Austin. Call our office today to get a quote on professional window tinting.